Before I get going, I just want to make one thing clear. The easiest way to fix the NHL’s point system is to just scrap the shootout. Fire it into the sun. 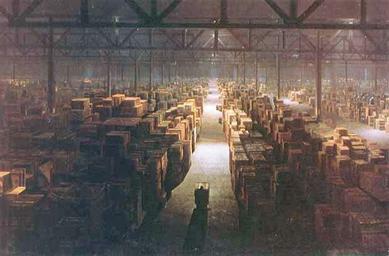 Store it in the warehouse from Raiders of the Lost Arc. Just get rid of it. Then let the teams play continuous 5-on5 overtime until there is a winner. Get rid of the extra point garbage and let the standings be decided by the win/loss column like most professional sports do. Clearly it’s not that simple. The league seems to be hell-bent on keeping hockey games decided by skills competitions rather than pure hockey. Next season will see a new 3-on3 format introduced to the extra time experience and you better believe that shootouts are still around. Shootouts are sometimes exciting, sometimes embarrassing, and are always a trivial way to decide a hockey game. But that’s a rant for another day. This post isn’t about the quality of play at the end of the game, but rather how points are awarded after the games. In the current system one win is worth 2 points (regardless of if it’s in regulation or overtime), a overtime/ shootout loss is worth 1 point and a regulation loss is worth zero. In the current overtime/shootout format, the extra point for losing in OT is absolutely necessary given the randomness of the outcomes. A team could be dominating possession all game while the other team tries to just hold on and get the game to a shootout. Next thing you know 4th line scrub Niklas Hagman rips a shootout goal and you are out of a win. It would just be insulting for the losing team to not get a point. The problem I do have with this system is that on any given night there is uncertainty going into a game on how many points will be awarded to the two teams involved. In a regulation win there are 2 points handed out, but overtime games there are a combined 3 (2 to the winner, 1 to the loser). These games literally mean more. It is a statistical inconsistency that just makes it that harder for teams to distance themselves in the standings. Now, the standings do not change drastically, but these new standings are a far better representation of how NHL teams performed in the 2014-15 season. The biggest change was the Los Angeles Kings leap-frogged and Winnipeg to grab the first Wild Card spot. At first glance that might seem strange. 45-win Calgary doesn’t make the playoffs yet the 40-win Kings do? The reason this make sense is that Los Angeles had a fantastic regulation record of 37-27,impressive considering only 3 more NHL teams had more than 37 regulation wins. The reason they missed the post season was a brutal 3-15 record once games went into extra time with a very unlucky 2-8 record in the shootout. The Flames on the other hand had a very average record 32-30 in regulation but definitely capitalized in extra time going 13-7 after regulation with a 4-3 record in shootouts. My point system decreases the severity of some of these BS shootout losses and rewards teams that play well for 60 minutes of real hockey. Calgary was a nice under dog story this year. But I would have been much more entertained by having a much better Los Angeles Kings team in the playoffs. Here are some of the pros and cons of the new system.